A pleasant Greene King pub on Northumberland Avenue, near Trafalgar Square. As befits its location, this pub tends to get quite busy with tourists and on a Sunday afternoon was full by around 5pm, though it was possible to get a small table in the late-afternoon. The decor is, as you might expect, dedicated to the famous fictional detective created by Sir Arthur Conan Doyle. They even have a small television playing old black-and-white Sherlock Holmes serials, with English subtitles (no sound). 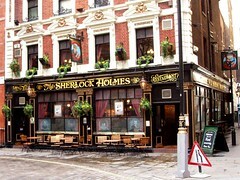 They have Greene King IPA, Old Speckled Hen, Abbot Ale and their own bitter, Sherlock Holmes Ale, on tap. They gave me a small sample of the latter to try when I expressed interest, but in the end had a pint of the Hen, which was well-kept. On an August 2008, Ewan had a full half of the Sherlock Holmes Ale (£1.55/half), but it wasn't really as good as the regular offerings. The bar is kept very clean, empties are quickly collected and tables regularly wiped. Food is served noon-3pm and 5:30-10pm Monday to Friday, and noon-10pm Saturday and Sunday. All mains are £6.75, with chips coming in at £2 and onion rings at £2.50. My vegetarian pie was nothing special (mainly peas and carrots), but was served in its own bowl and had a lovely puffy crust. It came with some nice fries and a small salad. There is a separate restaurant dining area upstairs which may have a different menu. The website also mentions free wi-fi, but haven't been able to verify this. Last visited by Ewan, Jo and others, 30 August 2008. Opening hours and food times taken from pub's website, March 2008. Last edited 2013-05-10 08:01:30 (version 8; diff). List all versions. Page last edited 2013-05-10 08:01:30 (version 8).